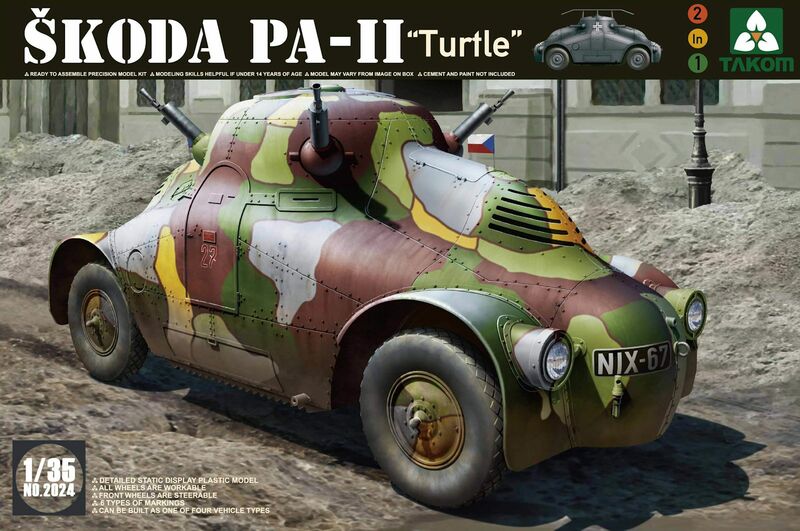 The Modelling News: Build review - Takom’s 35th scale Skoda PA-II "Turtle” a build of two halves? What a weird little vehicle… This Skoda armoured car was called the “Zelva” or Turtle for fairly obvious reasons, and this new kit from Takom gives you a good reason not to not buy the now quite expensive CMK kit (140 odd dollars’ worth) and get this simple kit from Takom instead. 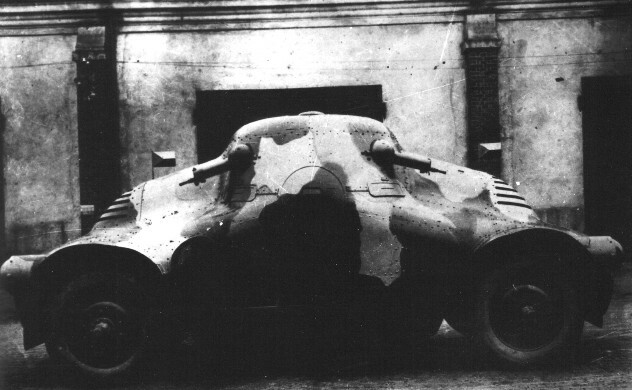 The PA-II ("Armoured Car II") was developed by Škoda who wanted to produce a hull with an all-around streamlined armoured bodywork. It first saw service in 1925 with the Czechoslovak army, but they were bulky, heavy and not very agile, with poor ground clearance that forbade off-road rides and an internal fighting compartment that was too cramped. 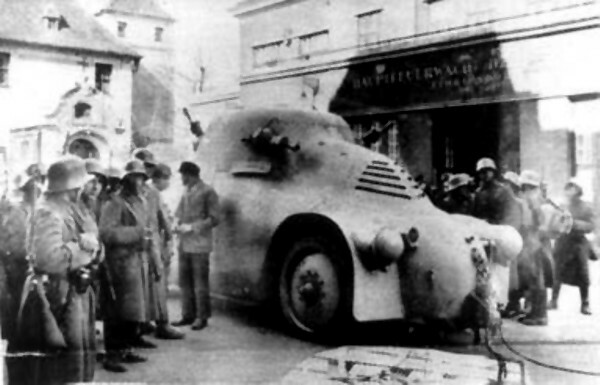 Instead, Skoda sold three of them to Vienna's police forces in 1927, and participated in the famous beer hall putsch suppression operation. The remaining nine were purchased by the Czech police. 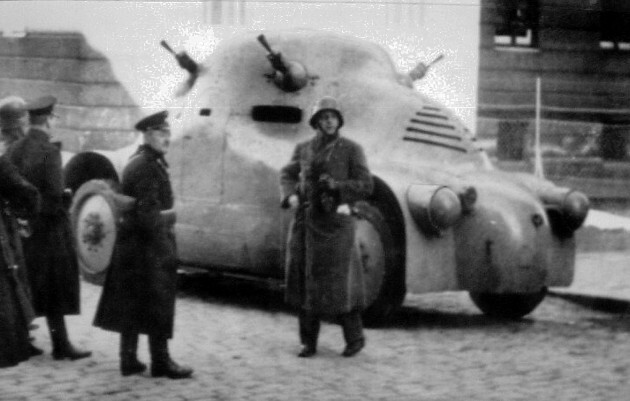 A number of Czech vehicles were seized and incorporated into the Wehrmacht after 1939, modified to use a radio, as radio relay vehicles. Their operational capabilities were rather limited, but they seem to have been used until 1945. 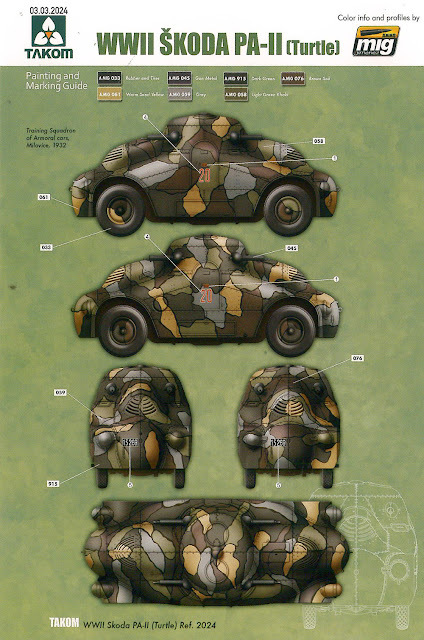 This 1/35th kit of the Skoda PA-II "Turtle" Czechoslovak Armoured car is another of the radically different choices by the model maker Takom. We have reviewed a bunch of their kits here on TMN and found them to be incredibly simple to make, usually accurate and a model that concentrates on the simple things whilst still being quite attentive to detail. 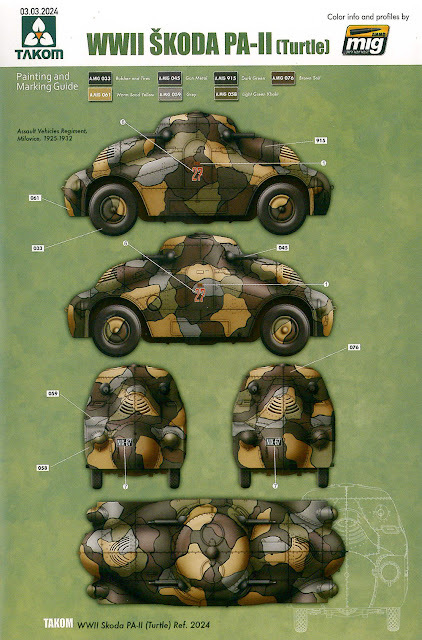 This kit includes no photo etch, just simple styrene of four light grey sprues and one clear sheet for the headlights, front and rear along with four vinyl tyres. The box has some pretty polished box art and it is a kit of medium size and a structure that does not seem too detailed or complex – this is just the usual style of kit that Takom seem to have made their own – very much like the original “White Box” Tamiya kits of the past, only with better moulding techniques. 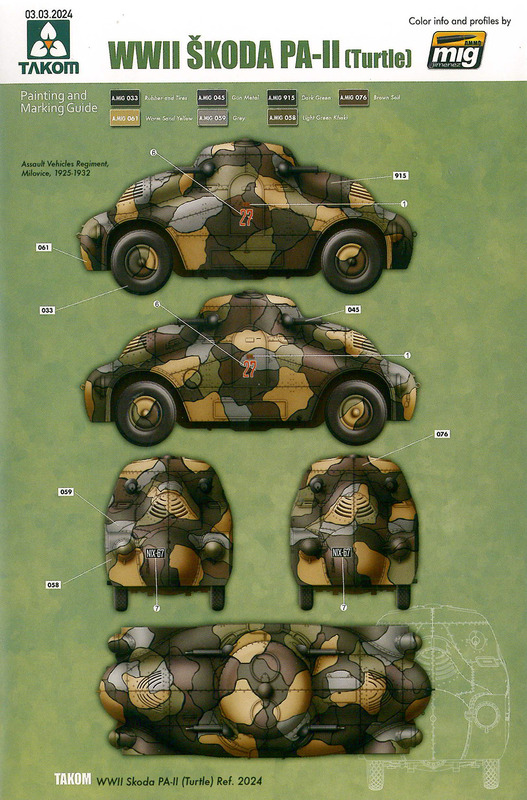 Let’s look closer - we will start at the instructions, then the plastic and then the decals and markings, then we will build the kit up to show you if it’s as easy and as fun as we thought it might be. This is where you really get the feel for the simplicity of the kit. A small A5 black and white booklet of only ten pages and twelve instruction steps – it isn’t rocket science. 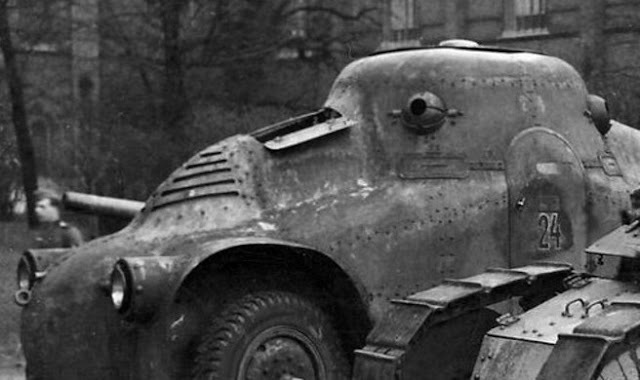 You pretty much do everything twice as the nature of the armoured car is that it is almost the same on the front as the rear of the car. In fact it’s hard to work out which way is facing forward on this car without looking at pictures. The pictures and the instructions are very simple with no real problems that we encountered and we will show you more of them as we build the kit. Did we mention it only took eight hours to complete from start to undercoat-ready? The one clear sprue houses the four headlights of the vehicle – rear and front. You can expose these or leave them covered, or do a mix of both. The lenses themselves are clear – and we were not sure of these were patterned so no harm no foul I suppose. They do fit neatly inside the housings though without glue even and that is a bonus. Sprue A contains two of the same sprues that feature not only the wide mudguards but the front and rear underside of the hull/chassis. It also contains the four parts of the “turret” of the armoured car, these house the machine gun balls and they are an odd fit – the jury is out whether these will go together very well so we will see when we build this/ Rivets feature on these top panels prominently. Sprue B is again a double- up (pretty cheap injection costs with this model it would be fair to say.) The four leaf springs, the machine guns, the headlight covers and everything that hangs onto the hull is included here. Also the wheels are all here as well. The largest part of this kit – this hull is a really ingenious shape that allows the four “turret” parts which slot straight into the sockets. Again as we mentioned earlier we are not sure it it’s as clever as it sounds. We will see in a second. The hull’s rivets feature here – not too pronounced and easily sanded back if you like that better. The doors are sealed shut which is a bit of a bummer, you can see the small hollowed out ended exhaust on the lower right here. This picture at an angle show the large clown like nose of the turtle. 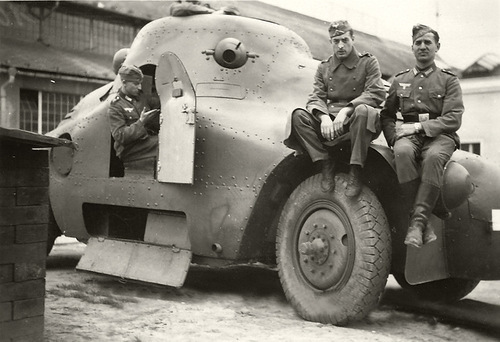 Notice how there is a seam straight down the middle that divided the whole armoured car? More in this later. The other side of the car is almost the same as the one we just looked at without the filler cap and exhaust. These new treads are pretty skinny but they are nicely flash free and the cross pattern tread is deep enough. All looks good here! Depending on whether you like these Vinyl tyres or not – they are pretty simple once you get the knack of weathering them. Five different markings fare supplied in the instructions by partners AMMO from Mig Jimenez’ team. 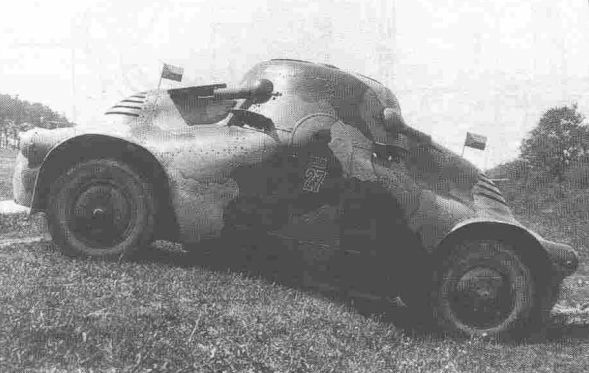 They show four Czech pre-war versions and one captured German radio car without machine guns but with a radio mast. Colours are provided in AMMO colours, although these are the only paints featured we at least get the colours of the paint so you can source or mix your own. 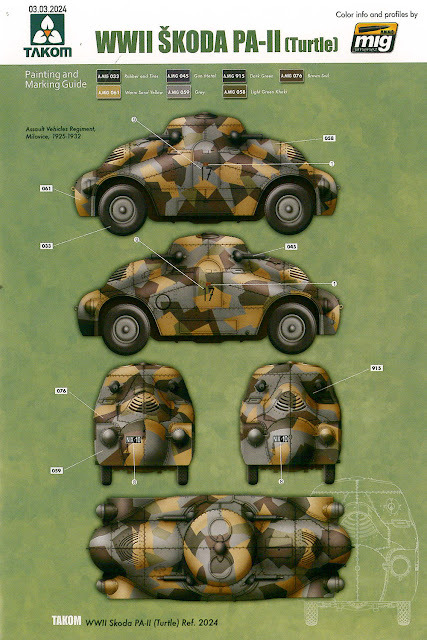 These Czech versions are pretty nice and I like the splinter camo of this “17” version here from the assault Vehicles regiment in Milovice from 1925-32. 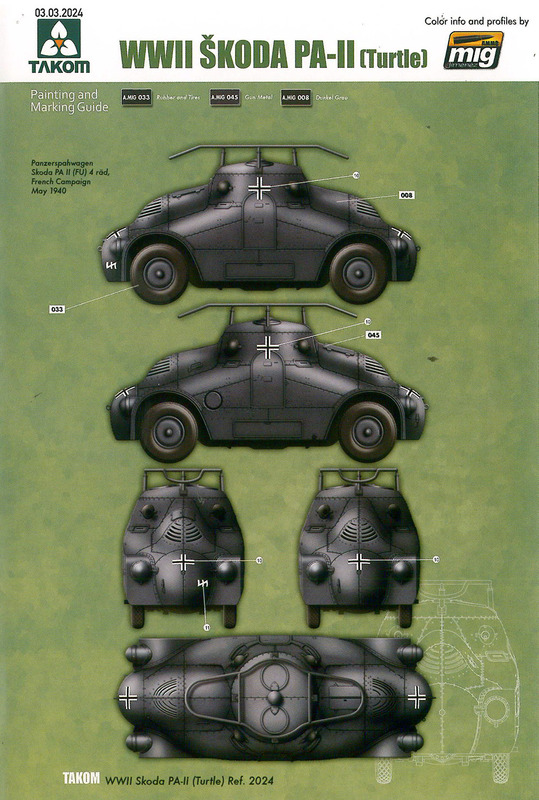 These other Czech vehicles are coloured similarly, but with the WWI style black lines that segregate the shades. This is simply done by many modellers with a felt pen (yes a felt pen) so it’s not as hard as it looks. There is one small sheet of decals housing not only the vehicle numbers but the number plates of the Czech vehicles as well as the German and Czech national markings. The decals are not too thick and not too shiny with a minimum of carrier film which is very helpful for armour guys who have a lumpy kit with rivets all over it to make. The steering of this car is posable and the undersides front and rear (or is that rear and front?) these parts are put together twice for the front and rear and they simply go together in the centre to make the floor plan/ chassis of the car. This all together is already leaving us at stage four of twelve! Step Five is the simple gluing on of the wheels and the slipping the tyres over them – as you can see it’s a tight fit and you might not want to glue these to the undersides just yet as we will see in a later step. Step Six is the act of placing the four quarters of the “turret” together. These two halves then sit on top of the jigsaw –like hull. It all seems pretty easy but here you see the first part of a problem. These quarters don’t go together the best and they need some serious glue to get them nice and tightly secured before they go on top of the hull. You do NOT want to be sanding curved surfaces near nice raised rivet detail do you? Step seven sees a few things going together as well as the machine guns (for the Czech versions) or the rounded empty balls if you are making the radio car used by “Ze Germans.” I made sure that I slightly hollowed out the barrels to make them more realistic. Step Eight sees the head lights go on. We have a picture of these headlights on a little later in the build but they simply sir on top of the front and rear hull. I used some AK Interactive reflective paste on the insides of the lights and the lenses slipped in tightly without glue. Step Ten was the next we attempted – yes we know it’s a jump but by doing it this way we can avoid pressing down on the top of the vehicle whilst we secure the mudguards of the armoured car. You can see here there is a seam that you will have to fill if you do not want to have these open guards exposed to the laughing of your mates at the model club. You can see here we have not attached the wheels to our kit in Step Eleven. We wanted to use some compression on the floor to secure it properly so again the turret was not put on as of yet. Step Nine is here and it’s a hard one to get right because of the rounded edges of the turret par and the sockets. Even with the test kit we saw a little bit of fouling on the joint as you can see here where it meets the hull. I ended up using an elastic band to secure it down with a lot of time consuming holding this part down and trying not to get glue over my hands and then on the kit scarring the plastic near the joints. Now this is the thing I really did not enjoy with this build. I have a radical idea – to make this kit in two halves – and then the natural seam that splits the car can be easily glued together just like an aircraft. Simple – and no bottom clenching minutes that pass too slowly as these parts secure. Test fit, test fit and do it again and you will still have issues. Sanding sticks will clear any residue without hopefully any collateral damage. The two halves idea (and I am not that smart) would solve this problem. To me it’s cool moulding techniques over smart moulding techniques. See the pitted joint in the turret join? 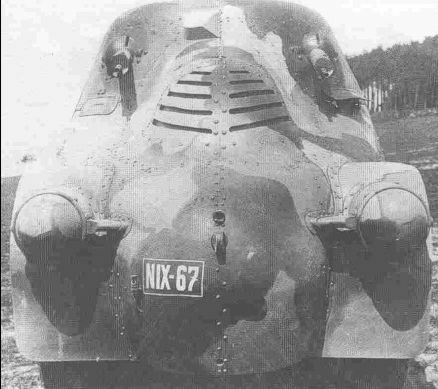 Also notice the one real bit of seam on the front of the nose of the armoured car. This isn’t a big deal to clear though. The two mudguards are sealed with some Tamiya putty – not too difficult to fix these troughs. The radio rack for the German version simply sits on top - you should however not put the barrels inside the machine gun mounts in this version. It only took a night to make – but unfortunately nearly as long to clean up the seams on the turret join as everything else. It wasn’t a big deal, but it could have easily been avoided by the split in half method. I did however enjoy making this weird little turtle – it was an easy and simple kit to make without too many an issue and having to revert to photo etch. You could detail this kit more by carving out vision slits or opening the doors. This will take some time but with figures inside it will show how small this car is. A great little kit after you get “step Nine” sorted out!! 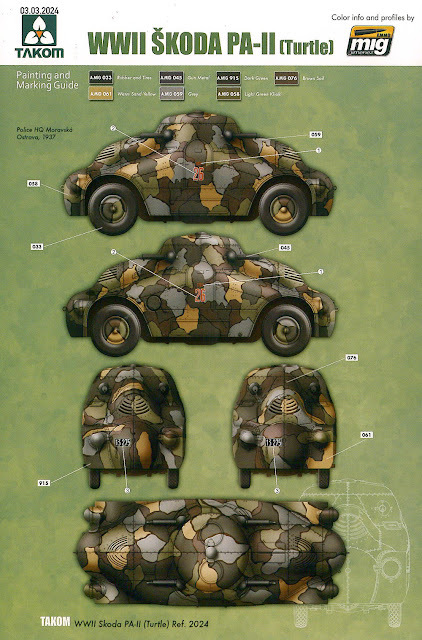 We have the coolest idea for a diorama already - we will see if it gets to paint the whole kit looking pretty cool.